The new Trend safety mask is a must-have item. Trend’s new personal protective equipment (PPE) is designed to protect its users from health and safety risks. Working with certain materials presents many of those. So why do you need a Trend safety mask? Its main objective is keeping dust away from your face, protecting your lungs in the process. It also reduces exposure to wood dusts. This decreases the chances of encountering chemicals that lead to irritations, dryness, soreness and even picking up conditions such as asthma. Where this face mask excels is the features that come with it, which we highlight below. Any condensation that builds up quickly evaporates due to the air. In addition to the aforementioned it is well worth mentioning the excellent layout of the safety mask. It is comfortable and unobtrusive. Naturally this means you’re less likely to take it off in between tasks. As a result you will benefit from what it has to offer and not just see it as an optional accessory. Stealth P3 filtration captures a staggering 99.999% of airborne particles. That is almost 20% more than older disposable masks. Furthermore, that less than 1,400 (per 1,000,000) particles penetrate the mask highlights how effective the filters are. They are a good size and easily replaced due to the detachment system. It is important to replace them regularly to ensure efficiency is maintained. Nuisance odour filters are also available. Another innovative feature of the Trend safety mask is its exhalation valve. More specifically, the fact that it points downwards. This is to avoid steam and fog entering the glasses or visors, therefore making for a less disruptive overall experience. It can be easy to brush off the need to wear PPE. Excuses can be made, often highlighting that they aren’t comfortable. Or that they get in the way of things, proving more of a hindrance than help. These criticisms cannot be applied to the Trend safety mask. In conclusion, the Trend safety mask ticks all the boxes. An improvement on previous versions, it’s easy to wear and incorporates modern technology with common sense adjustments. Most importantly, it preserves your health. 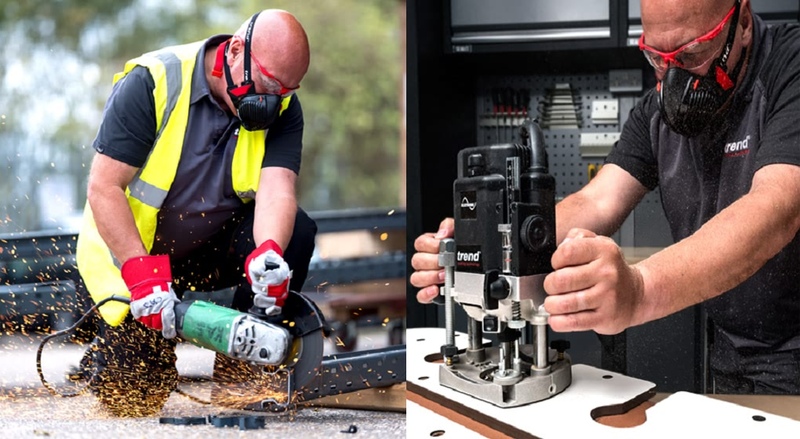 If the Trend safety mask looks like a worthwhile acquisition to you then visit one of our showrooms to see it for yourself. You can also see a live demonstration of it at an upcoming trade show. If you would like to purchase the stealth mask, please click here and order before 17.30 for next day delivery.